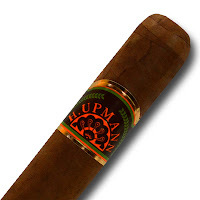 The fillers on this cigar are a mixture of Dominican and Nicaraguan tobaccos. The binder comes from the mountains of Nicaragua. A dark Sumatra wrapper from Ecuador encases all the delectable tobaccos. The wrapper has a slight marble look and is one of the best looking Sumatra wrappers, I have seen. The construction is solid with a nice draw and the cigar is topped off with a triple cap. A sweet hay aroma is heavy and it took me back to my boyhood, long hot summer days putting hay up in the barn. The aroma is undeniable and pleasant to the senses. My initial first few puffs brought about dark coffee bean and spices. A leather aftertaste, was left on my palette with notes of wood right along side it. At this point, a white flaky ash has began to form and I'm getting large volumes of blueish gray smoke. After the first inch and a half, the flavor profile picks up dramatically. I began tasting an apple flavor that intermingled with nuts and spices. The flavors gel nicely and my interest was piqued at what else I would find. The leather aftertaste still remains and is only to be outdone by the effervescent aromatic smoke pouring out of the cigar. The burn has remained intact and even. At the halfway point, the spice tones are at the forefront with a sweetness in the background. I'm still getting hints of coffee and a dry pepper tone in the back. The back half, is just as bold as the first half. Notes of cream pop up and the spice notes have remained throughout the entire smoke. Toasted almonds come alive in the final stages and add a pleasant flavor to the cigar. A boldly flavored cigar that has a wheel house of flavors to offer. The cigar is complex and if you're a full-bodied cigar fan, it will be a cigar you will revisit again and again. I'm giving it an A+ and will definitely be recommending this cigar to all my fellow BOTL.